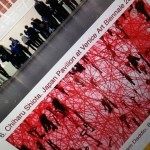 Japan’s contribution to the 56th International Art Exhibition – La Biennale di Venezia is an exhibition by artist Chiharu Shiota entitled The Key in the Hand. 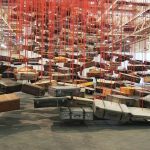 Curated by Hitoshi Nakano, the Berlin-based Chiharu Shiota created a large-scale installation with the whole exhibition space filled with red yam. Attached to the end of each piece of yam, suspended from the ceiling, is a key. There are also two boats on the floor beneath the yam and the hanging keys. 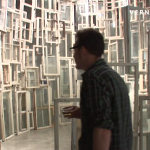 Chiharu Shiota: The Key in the Hand. Japan Pavilion at Venice Art Biennale 2015. Preview, May 7, 2015.